Make sure Edit Mode is ON this is located in the top far-right of the site page. Step 1: Click the plus on the Site Menu, then choose Tool Link. 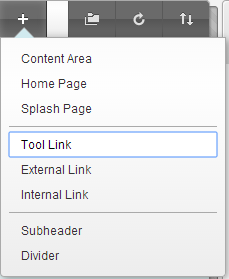 To create links to content items, use the Internal Link option. 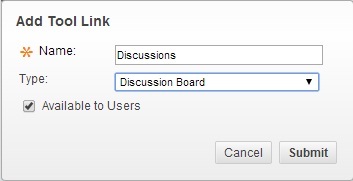 To create links to web sites, use the External Link option. Select the tool from the Type drop-down menu. If you want this item to be visible on learners' menus, check the box for Available to Users. Click Submit. The link to the item appears at the bottom of the menu. If (u) appears after a tool, the tool is off. To turn it on, in the Control Panel select Customisation then Tool Availability. Be sure all of the tools you want to use in your site are checked.